Have you tried Yoguru's new Thai Milk Tea flavour yet? Here's your chance! From 7-13 November, get a Small Thai Tea Yogurt for FREE* when you purchase any 2 Small cups. Available at all Yoguru outlets ALL DAY! *Not valid with any other discounts or promotions. Toppings not included. 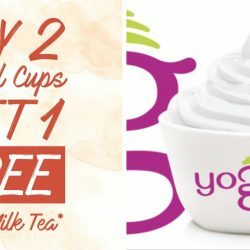 BUY 2 AND GET A $5 YOGUVOUCHER FREE! Come and say hi to our Yogugirls at Yoguru @ The Clementi Mall. 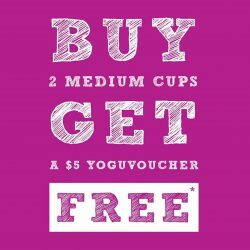 We are giving away $5 YoguVoucher for every purchase of 2 Medium cups. Grab it before it’s all wiped out. Satisfy your dessert cravings with a Healthier choice! See you there! Come to enjoy christmas edition Yoguru vouchers available at all stores. Buy and grab 5 get 1 FREE spread the love and give the gift of Yoguru this Christmas. 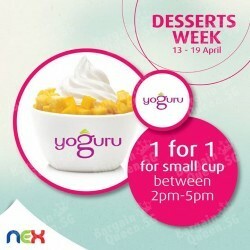 Enjoy yoguru (#03-K20) desserts week offer 1-for-1 Small Cup @ NEX. Yoguru @ The Clementi Mall celebrates its Grand Opening this Saturday, 4th April. 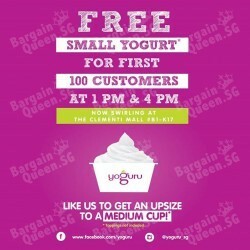 They are giving out 100 FREE Small Cups of Yogurt in any flavour to the first 100 customers at 1pm AND 4pm respectively. Do share with your friends and family! Hope to see you there! CALLING ALL SIM STUDENTS! 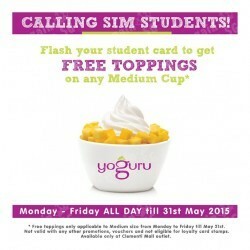 Flash your student ID to get FREE TOPPINGS with every Medium cup purchased! Available ALL DAY, Monday to Friday only at Clementi Mall. Till 31st May 2015! Grab your yogurt fix now! A week more to Christmas. 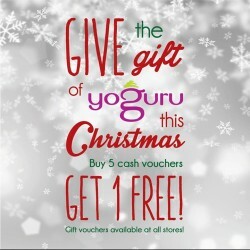 They are selling Christmas edition Yoguru vouchers! Buy 5 get 1 FREE! Spread the love and give the gift of Yoguru this Christmas. Available at all stores. Head down and get yours today! Selamat Hari Raya! 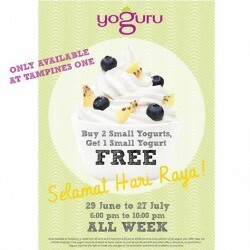 Grab 2 cups of small yogurts at Yoguru and get 1 small yogurt for free! Promotion available at Tampines One. Valid till 27 Jun. 2014 (6PM-10PM).